Flipping heck! Is it really a month since I last had the time to write a review? And are we still doing reviews at the end of June? They're normally done and dusted by the end of March, but this year we've had so many brochures submitted for review, and such a busy season for all sorts of reasons, that we will definitely stray into the second half of the year before the teetering pile is finally demolished once and for all. At a meeting with a couple of boyoes from the concrete mould industry a week or so ago, we fell into a discussion about the future for the wet-cast industry, and whether there will still be one in five year's time. My companions hail from Europe and were quite pessimistic but I cautioned them: never underestimate the resilience of the British wet-cast tradition. It may be that simple, riven effect flags have lost some of their cachet on the continent, but there is a bedrock of support on this side of the channel, and that support helps smaller manufacturers operating at a local and/or regional level to survive. 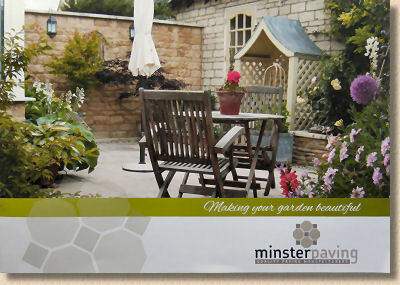 Minster Paving, based in Witney, Oxfordshire are just such a company. 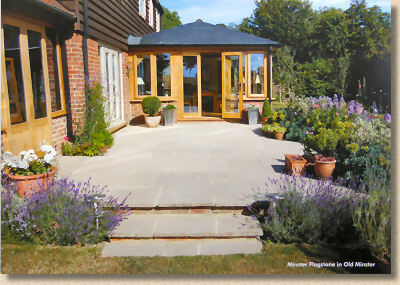 They have been manufacturing a fairly comprehensive range of wet-cast flagstones and accessories for over 30 years and they specialise in a colour palette ideally suited to their location on the very edge of the Chilterns, with its honeyed limestone and soft textures. The fact that they are so acutely aware of their locale and the tastes of their customers allows them to keep manufacturing and selling at a time when too many of their fellow manufacturers have either succumbed to the easy sell of imported stone or given up the game completely. So, how does a relatively small manufacturer keep the tables vibrating and the sales ticking over? A lot has to be down to local reputation, along with a level of customer service unimaginable to the national Builders' Merchants and DIY sheds, but a bit of professional standard promotion will always help, and the one thing that marks out a reputable company is a quality brochure. Which brings us to what has to be acknowledged as a pretty impressive publication for such a relatively small manufacturer. Full colour, heavyweight quality paper, A4-landscape format and running to 24 pages, it need not feel embarrassed to be seen in the company of brochures from much larger, nationally distributed manufacturers. There's a charming, cottage-garden flavoured cover shot with a snazzy company logo and a distinct whiff of professional design. Inside, the opening blurb emphasises the locally based nature of the business, and the fact that customers are buying direct, so can specify exactly what they want rather than be told they need to buy in full packs put together for the convenience of a retailer. This is exactly what sells to their target audience! 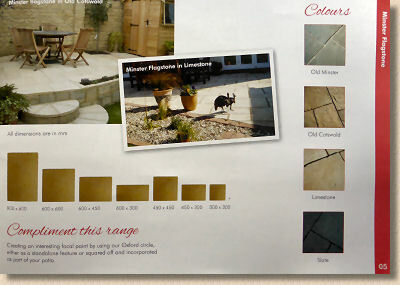 The products themselves are above-average wet-cast stone and riven effect flagstones in five ranges which span the majority of tastes, from pure Oxfordshire 'Old Minster' based on a local village, to the more contemporary Travertine. 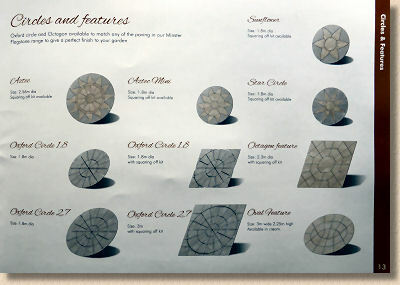 These are then backed-up with a generous range of complementary accessories, including circle of various sizes, octagons, walling, edgings and stepping stones. The fact that the company is still in business after all these years is testament to the product quality. You don't last long in this business if what you make doesn't last, or if it isn't what's wanted by the local clientele, but what about the brochure? Can a small, locally based manufacturer really put together a brochure that's worth considering? In short, the answer is a very definite yes, but this has been achieved by some clever use of resources. Obviously, they don't have the multi-thousand pound budget of the larger manufacturers, and so the images which cost serious money to acquire, the grand houses with grand patios, are more limited, but when such shots are used, they are generally well-composed, showing off the product to best advantage, and because they aren't found on every other page, their impact is somehow amplified. Much of the remaining photography is product close-ups, which can be be done in a studio at much lower costs than 'on location' shots, but the images are more than adequate and portray the various castings exceptionally well. The text is pretty much spot-on. There's enough to explain the products and the potential uses, but none of the silly, aspirational and unachievable nonsense that sometimes blights promotional materials. It's paving, FFS! It will NOT change your life but it might just make your garden that bit more enjoyable this summer. Technical info is largely noticeable by its absence, but that is primarily because these are patio products sold in whatever quantities you require, so no need for pack sizes, pallet weights or confusing size distributions. There is a basic but informative installation guide (I know it's informative because I wrote it!) and some very useful layout plans. And there you have it. When you consider this brochure has been put together by a small, family business serving an area probably no bigger than a 20-25 mile radius from its Witney base in a predominantly rural part of the country, and selling a product range which has endured a tortuous time since the first crate of imported sandstone landed almost 20 years ago, it has to be acknowledged as something very special. It's an enormous credit to the company behind it, and it sets a very high standard for other wet-cast manufacturers to emulate. If you're anywhere near that neck of the woods, get a copy to show your customers. For those a little further afield, maybe if we pester them enough, maybe they'll put a downloadable PDF version on their website.